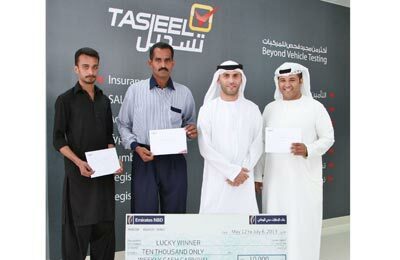 Tasjeel, the UAE-based shop for vehicle testing and registration needs, has rewarded the first four winners of its two-month long ‘Weekly Cash Carnival’ promotion with Dh10,000 ($2,723). The campaign, which runs until July 6, is offering a total cash prize of Dh130,000 with eight weekly Dh10,000 prizes each, and a grand prize of Dh50,000. Under the promotion, customers get a free raffle ticket for any purchase of Tasjeel services, said a statement from the company. The winners for the first four weeks are: Shahid Farooq Mohamed (Pakistan); Hamad Naair Nahar Al Hajeri (UAE); Zulfiqar Khan Irshad Hussain and Raheel Mehmood Ashraf (both from Pakistan). Sales manager Samer Kaddoura handed the prize to the winners and said: "Tasjeel undertakes all mandatory tests that are required for vehicle registration, in its nine branches in Dubai, Sharjah, Khorfakhan and Hatta, and all sites are equipped with the latest testing and inspection machinery."